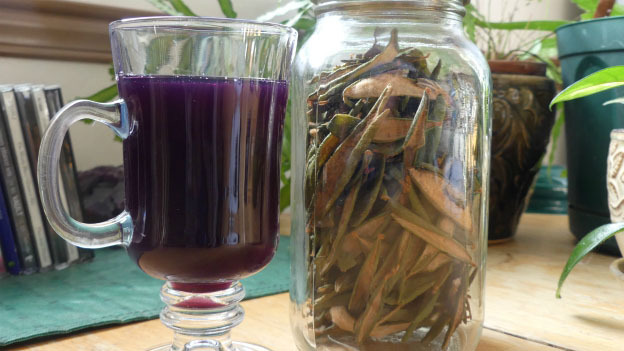 A refreshing fruit juice made with Labrador tea and blueberries. This relaxing beverage can help you unwind when needed. In a large saucepan, bring blueberries and water to boil. Reduce heat and simmer, stirring often, until blueberries break down - about 5 to 10 minutes. Add blueberries to the brewed Labrador tea. Add sweetener of choice to the blueberry tea mixture; stir and then let cool to room temperature. Refrigerate until cold, about 2 hours. Strain mixture into a pitcher. Stir in lemon juice. Serve with ice cubes if desired. IMPORTANT: To make tea, do not boil the leaves as this releases andromedotoxin,a potential toxic alkaloid. Boil water, let sit 5 minutes then steep the leaves about 5 to 10 minutes.